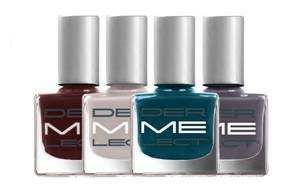 Dermelect recently sent me their Fall collection, and I chose Sophisticate to try first. This was really a dream to apply- I got smooth, perfect, even coverage at 2 coats. I used NYC Grand Central Station as my topcoat and it dried so quickly. I'm looking forward to trying the other four shades soon. My kiddos started school this week, and we just returned from a week-long vacay last Saturday, so it's been a bit crazy at our house this week! With a jewel and earth-toned color palette, these creamy colors are your ultimate accessory. Disclosure: This shade was provided to me for review purposes.